Why Is America’s Infrastructure Collapsing? The United States has an infrastructure problem. Globally, the U.S. ranks 19th — behind Spain, Portugal and Oman — in the quality of its infrastructure, according to the World Economic Forum’s Global Competitiveness Report. 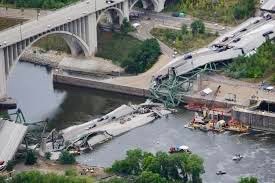 The American Society for Civil Engineers (ASCE), in its annual Infrastructure Report Card, gave the U.S. a D+, saying we need to invest some $3.6 trillion by 2020 to upgrade our infrastructure. Yet investment in U.S. infrastructure continues to lag, even as jobs growth, GDP growth and home sales all have rebounded since the end of the recession. Economists have long argued that better infrastructure — roads and highways, bridges and ports, tunnels and dams — results in greater jobs growth and business investment. So as government finances improve, why aren’t we seeing infrastructure spending return? Quantifying infrastructure investment is a challenge, but one place to start is by looking at the amount of money the government spends on buildings and large-scale projects. 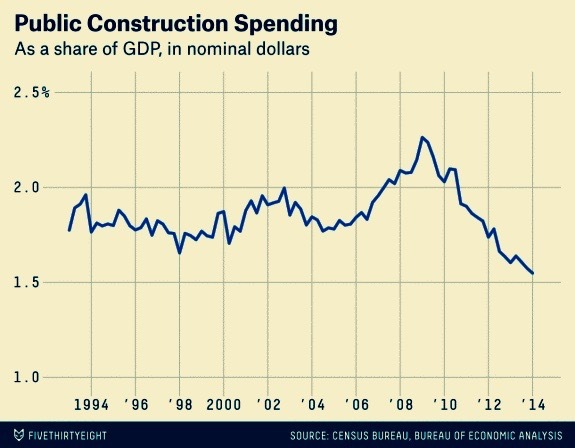 Nationwide, public construction spending is just over 1.5 percent of GDP — the lowest share since 1993. Public construction does not exactly equate with infrastructure investment, but it’s a fair proxy. This To The Contrary documentary special takes a look at infrastructure. How are neglected roads, bridges, ports and public transportation affecting daily life? State government spending has grown over the the last few years as fiscal balances have improved. For the first time in five years, no state is expected to run negative balances in both its general and rainy day funds, according to the latest Pew Charitable Trusts Fiscal 50 report.